Oscar Martinez was born and raised on the north side of Chicago. He earned his bachelor’s degree in English with a minor in Urban Planning from UIC in 2018. 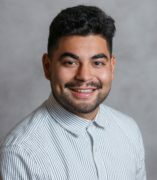 As an undergraduate, Oscar spent much of his time conducting research on various topics from penal law to urban green spaces with the latter taking place while abroad in Berlin, Germany. Shortly after graduation, he decided to further his education in the Master of Urban Planning and Policy program at UIC. As a graduate student, he is focusing his efforts around spatial planning and how sustainable urban design can positively influence a community.